If you’ve ever hired a salesperson for your business, you know how long it takes to find the right person for the job. Some companies spend weeks, or even months, looking for candidates that have the ideal mix of passion, persistence, and enthusiasm that can ensure success in the role. When you spend all that time looking for the perfect sales rep, you’ll want to make sure that he or she has all the resources needed in order to hit the ground running. As a result, new salespeople are often inundated with an array of information practically from the moment they set foot through the door. From sales methodology handbooks to product spec sheets to brochures and other collateral, there’s no shortage of information for new reps to digest before being able to make their first sales call. But how do you keep your new sales team members from getting overwhelmed by all the information they need to learn? And how do you ensure that they retain the information so that they’re able to recall it when it really counts? Many forward-thinking sales organizations are finding that the answer to that question lies in the use of video. The process of onboarding new employees often presents unique challenges for sales organizations. Sales reps are often remotely located, so in-person live training for new sales employees can take a heavy toll on already-strained department budgets — particularly if training needs to be delivered small audiences and tailored to specific roles or regions. Video helps to address the specific problems associated with training sales reps by enabling organizations to create a training video library with up-to-date product information, best practices, scenario examples, role-play sales demonstrations, and more for everyone from entry-level sales reps to the most experienced executives. Using video for sales training can also improve your new hires’ ability to retain the information that they’ve learned. According to recent research, the retention rate for visual information is about 65%, while the same rate for text-based information is just 10%. Researchers credit interactive video content and the ability to learn at one’s own pace for the increased information retention. With video onboarding, your sales reps will have everything they need to quickly get up to speed, whenever and wherever they happen to be. Sales organizations aren’t just using video to onboard new employees. Video is helping to provide just-in-time training to existing employees as well. Traditionally, training a sales team in the latest updates to the company’s products and services is performed in-person on an annual or semi-annual basis, or through less frequent updates to myriad pieces of sales or marketing collateral. It’s a method that’s become far less effective in today’s always-on, constantly-connected marketplace which has little patience for outdated information. Video helps combat this by making it easy and cost-effective for sales and product managers to create training videos and demonstrations, then quickly share the recordings across the entire organization. With Panopto, for example, professional-quality training videos can be created with as little as a laptop or smartphone and its onboard camera. As soon as the recording ends, the system automatically uploads the recording, encodes it for viewing from any device, and indexes all words spoken or displayed during the presentation for maximum searchability. Your sales team can then search through the company’s video library for specific pieces of information and automatically fast-forward to the exact content they need before getting back to their activity. No more wasted time hunting and pecking through cluttered network file shares to find necessary information. Think your sales team is actually using all those brochures, handbooks, and FAQs your organization is writing for them? Think again. 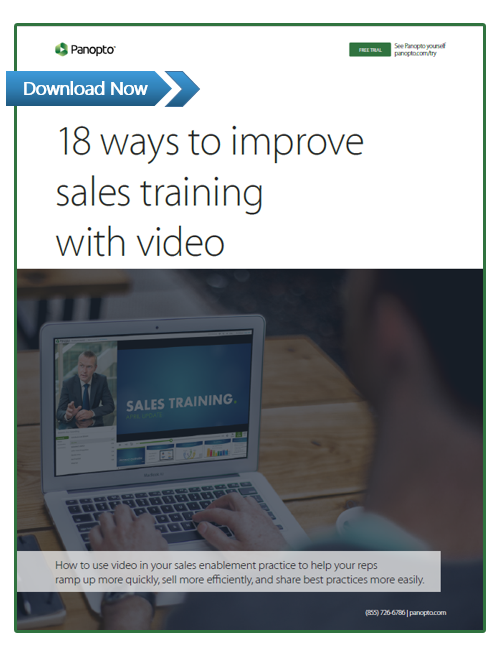 Find out how you can use video training technology to help your sales team improve its effectiveness in our latest white paper: 18 Ways You Can Boost Sales Enablement With Video.